13) How can I work with my 3 year old PomChi to help him relax and be less of a bully towards other dogs we meet? Dogs are social animals and actively seek out our companionship. They can quickly become accustomed to being part of a group 24 hours a day, seven days a week. Whenever a new dog is brought into a home, especially a young, playful puppy, people have a tendency to interact with them constantly. While this interaction is a very important part of socialization and bonding, you need to make sure that you are not setting your puppy up for a big disappointment when you must leave him at home alone. Including some “alone training” right from the beginning will be beneficial to both your puppy and you. If you have not already done so, start leaving your puppy/dog alone for brief duration’s throughout the day. He needs to learn that 1) people are not always around and 2) you will come back. When leaving your puppy/dog alone, put him in his crate or a puppy-proof room. Be sure to give him some of his favorite chew toys so he can have some fun while he awaits your return. Do not make a big deal out of leaving. Just pop the puppy/dog in his area and leave. Your puppy/dog may start to whine or bark when you leave. This is very normal. Your first impulse may be to return to the puppy/dog and try to calm him, however, that is the worst thing you can do. If you want him to stop whining, you must make sure you do not reward the puppy/dog for whining. Do not pay any attention to your puppy/dog and do not let him out until there is a lull in the whining. Reward him for being calm and quiet. Leaving your puppy/dog at home, at the veterinarians, at the groomers or a boarding kennel should also be a very low-key, non-emotional event. Likewise, the same applies when returning to your puppy/dog. If you make leaving or returning into a big event, with lots of cuddling and petting, your puppy/dog is more likely to be stressed by your arrivals and departures. You can, and we hope you do, miss your puppy/dog when he is not with you. We just do not want to let him know that. 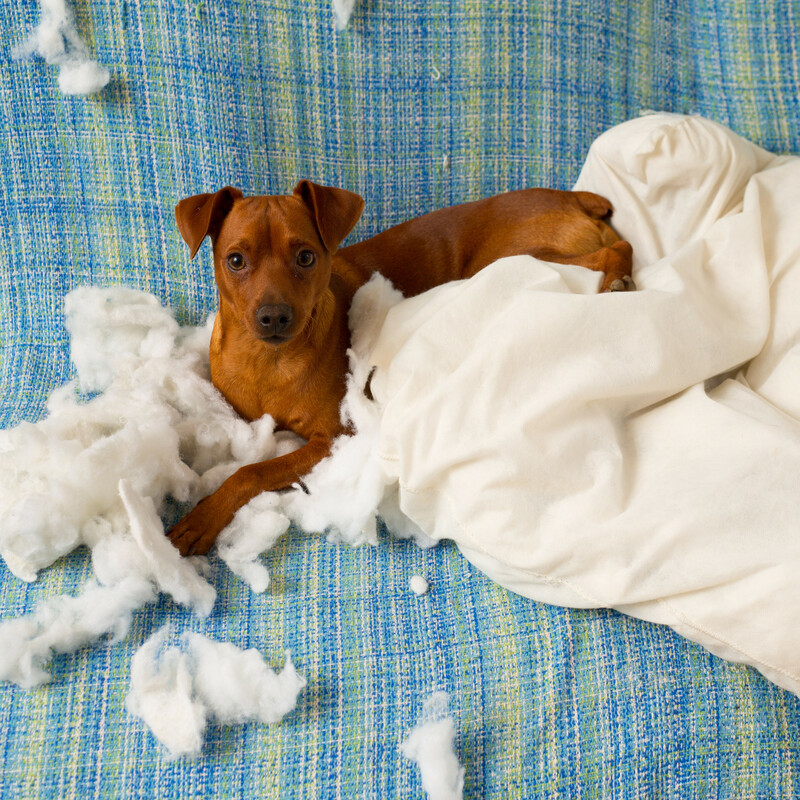 If this behavior does not improve after a few days, consult with a Certified Dog Behavior Consultant (CDBC) or Certified Professional Dog Trainer (CPDT). They can help you assess the behavior and make recommendations on how to help your dog. If your dog exhibits destructive behaviors such as digging, scratching or chewing on themselves, house soiling, destructions of objects, extreme vocalization, constant pacing, digging and scratching at exits such as doors and windows in an attempt to reach you, and following you excessively, never letting you out of sight, then you should immediately discuss this situation with your veterinarian. These are symptoms of separation anxiety which may require treatment with appropriate medications and a behavior modification program specific to separation anxiety. Your veterinarian will probably refer you to a Certified Dog Behavior Consultant (CDBC) to develop a behavior modification plan for your dog and your family. Resolving separation anxiety will typically involve changes in your family’s behavior in addition to your dogs. This is typically not an easy problem to resolve and becomes more difficult to resolve the longer it goes on. That is why teaching your dog to cope with being alone is an excellent investment of your time. In this week’s show Kate, Don and Dr. Dave Cloutier of the Veazie Veterinary Clinic discuss the American Animal Hospital Associations (AAHA) new guidelines on behavior management for dogs and cats. This groundbreaking document represents the first time that a major veterinary organization has addressed pet behavior. According to the guidelines “More dogs and cats are affected by behavioral problems than any other condition, often resulting in euthanasia, relinquishment of the patient, or chronic suffering.” Tune in and learn why behavior is so important and why a behavioral assessment should be part of every pets annual wellness exam. 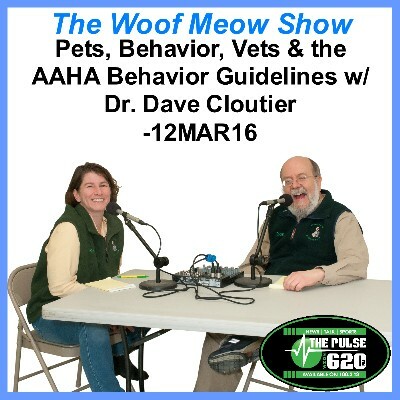 Dr. Cloutier, Kate and Don discuss reasons for an increase in behavior problems, and how these problems can best be addressed. Dr. Cloutier explains changes he and his colleagues have made to work towards free-free visits for their clients. We address serious behavioral problems such as separation anxiety and aggression as well as nuisance behaviors like jumping, barking, and counter surfing. We address how veterinarians and dog trainers can work together and why it is essential to focus on rewarding desired behaviors and removing rewards for unwanted behaviors. Lastly we review the guidelines recommendations on refraining from using any training methods that use aversive techniques such as electronic shock collars, choke collars, prong collars, alpha-rollovers, and other things where that work on the basis of fear, intimidation, force, discomfort or pain. 1.) Is playing with a cat important, and what is the best way to play with a cat? 2.) I have a dog and will be moving into a new apartment with a friend who will be bringing their cat. What can we do to get both pets prepared for this change? 3.) During the winter I don’t always get my dog out as much as I should and he gets kind of crazy. What can I do to stop this behavior? 4.) My dog has chronic diarrhea and my veterinarian cannot find anything wrong. What should I do? 5.) Should dogs wear a coat when outside in the winter? How about booties? 6.) Do those dog whistles really work and do they make a dog come back? 7.) Should I use puppy pee pads? 8.) Is canned food good for a cat? 10.) 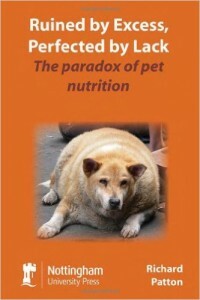 Is canned food good for a dog?